IndieBooks has partnered with Endeavour Media, the UK’s leading independent digital publisher, for the distribution of the digital editions of some of our books. IndieBooks will continue to handle the print distribution for all our titles while Endeavour will take over the digital editions of a selection IndieBooks’ growing catalogue. Read The Bookseller press release here. The following titles are now available in digital format, and, to celebrate, are free for this week only! We’ve been a little quiet recently as we took a short break to focus on upcoming publications, but we’ll be posting lots more into this new year. In the meantime we are excited to share with you some of the titles we have been working on! We’ll be adding more information on each of these over the coming weeks so make sure to keep an eye out if there are any that take your fancy. We also offer reduced prices on all our titles when you order directly from our website. White Panther, Quintember and Parricide are all currently available for pre-order for just £7.95, and Coming to Terms is available now for £10. Fame & Faces will be available for pre-order in Spring 2018 (you can sign-up to the mailing list here, for a reminder). We’ve had a few people get in touch after having problems activating our promo codes when purchasing books from our website. To make sure you can take advantage of your discount, please add your voucher code before you click checkout, as shown in the picture below. We hope this helps and if you have any further problems please don’t hesitate to contact frances@indiebooks.co.uk. p.s the code shown (FPP) is still live and will deduct the cost of postage when you pre-order Explaining Cameron’s Catastrophe or Explaining May’s Miscalculations – Happy Friday! No sooner had we announced the release of Explaining Cameron’s Catastrophe, our expert analysis of the 2016 European Referendum, did Theresa May announce a 2017 snap election. So now Cameron’s Catastrophe – which will be launched on 12th July – will have an unexpected, and yet to be named, successor…Will it be the majority May expected? Or did she miscalculate? 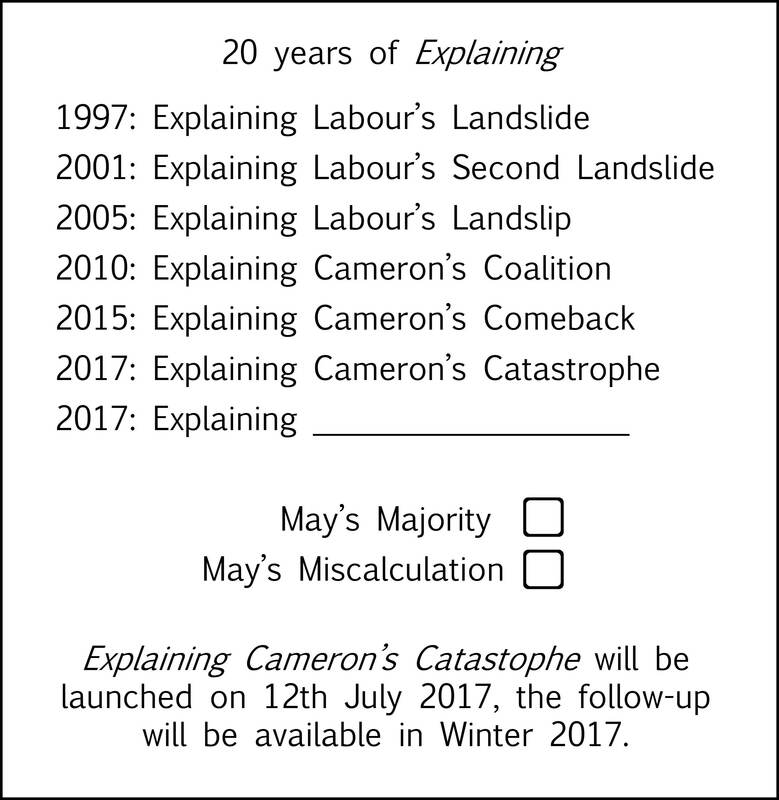 Guess today’s result to win a free copy of Explaining Cameron’s Catastrophe•! Explaining Cameron’s Catastrophe uses expert analyses of hundreds of surveys and focus groups run by Ipsos MORI to make sense of the UK’s 2016 EU referendum: how we got here; the context, content and process; lessons from 1975; what remain did wrong; why the leave campaign was so successful; voters attitudes; and the aftermath. It also explores what the 2016 referendum result, the 2017 general election results and life without the EU, means for the future of the UK. SIR ROBERT WORCESTER is the founder of Ipsos MORI. ROGER MORTIMORE is Director of Political Analysis at Ipsos MORI and Professor of Public Opinion and Political Analysis at King’s College London. PAUL BAINES is Professor of Political Marketing at Cranfield University and a specialist in the application of marketing in politics. MARK GILL advises governments and organisations around the world on public opinion research. Pre-order today to receive a £5 discount. *Winner to be announced 9th June 2017. One chosen at random from correct guesses. We are delighted to announce that two of our titles have made it through to the finals of The People’s Book Prize. King’s Company, by Jessamy Taylor, will be competing in the children’s category and Quintember, by Richard Major, in fiction. For any of you that did vote for these titles in the Autumn and Winter showcases, please be aware that these votes are not carried forward, and you are eligible to vote again in this round. We would hugely appreciate your votes where possible, for these two remarkable debut novelists. So, Day 1: and though I claim only part of the credit, so far so good. Yes, a few fly-by-night, here-today-and-gone-tomorrow outfits such as Lloyds of London have announced plans to shift jobs to the continent. But balance that against today’s spontaneous outpouring of national joy as we British throw off the oppressive yoke of the Brussels Eurocrats. Yes, there will be sacrifices. With the devaluation of the Pound, a decent bottle of Chateau Lafite Rothschild now costs well over £1,000. No doubt you will have noticed similar price rises in your own weekly shop. But be reassured: the hard work of building the economic miracle continues. My Brexit Advisory Committee is looking at a range of soft, hard and harder-still options, of which ‘Eye-watering Brexit’ is the current favourite. In this scenario, we’ll have to replace up to £230 billion of annual exports to the EU. That’s a lot of boxes of speciality tea and pots of damson jam we’re going to have to shift to the rest of the world over the next few years. But it can be done. It reminds me of my time at British Leyland. For all the sneering and jeering about the Austin Allegro by elitists such as my old friend and fellow embroidery enthusiast Jeremy Clarkson, we sold over 600,000 of them. (Almost entirely in Britain, as it happens, but that’s a detail.) With the right products, the right spirit and a large dose of tax breaks for the country’s wealth creators, we can Make Brexit Work! And if you can’t wait for my book to come out in August to discover how you too can benefit financially from Brexit, then look out for my next guest post. One of the fun bits of publishing that readers don’t usually see is the process of working up the cover design. We produce a design brief and the artist or designer will provide some rough ideas which we can discuss and also share with the author. Our forthcoming title The Ballad of Curly Oswald is set in a hippie commune in the 1970s, and the mix of domesticity and drug culture was one of the themes that showed up in the very first concepts. Ignoring our designer’s wayward spelling for a moment, this is the stage where we start to think what we do want by seeing examples of what we don’t – from this batch, we said no to the fonts but yes to exploring the idea of an abandoned caravan, which picks up the theme of the narrator, Curly Oswald, recalling his lost childhood, and the idea of an abandoned caravan that had been his childhood home waiting to be rediscovered in the depths of an English forest. We’ve heard a lot about Britain’s destiny as a Global Powerhouse outside the European Union – but not so much detail on exactly how this will happen. So in the week that Article 50 is triggered, IndieBooks is proud to announce a new book that maps out Britain’s glittering economic future. And who better to pen it that Sir Reg Futtock, the Prime Minister’s newly-appointed advisor on Post-Brexit Prosperity. For fifty years, Sir Reginald’s career has been synonymous with British business: from launching the world-beating Austin Allegro to taking RBS up to and beyond the pinnacle of international banking. Now he is bringing this wealth of experience to helping Britain plan for success in the post-Brexit world. In Mr Brexit: the Man with the Plan, Sir Reg will set out why we joined, why we left and who will be the winners and losers as Britain returns to Splendid Isolation. This book is not clogged up with facts and evidence: instead, Sir Reg uses his own experiences, from sacking 31,000 staff at Marconi to bribing members of the Saudi Royal family, to explain how Brexit can achieve its essential purpose: ensuring that Britain’s wealth-creators remain in charge. Although Sir Reg has a busy schedule caddying for Don Trump and grovelling to a range of foreign despots, he has promised us the book will be ready for publication in August. If you would like to learn more about some of the children featured in From Syria With Love, please watch this short documentary.